When Lynn asked me a few months ago if I'd want to join a 12-person relay team that would be running around the clock from the morning of Friday, July 17th until the afternoon of the 18th, I was (quite appropriately) apprehensive. But it sounded like a unique opportunity, so I quickly opted in. She got connected to the team leader through another friend and didn't know anyone else on the team, but as people dropped out, we were able to rebuild our van with friends (plus one guy who got stuck with us, unfortunately for him, but he was nice about it). As our 8:45am start time approached, we headed over to the starting line with Bree, who was the team's first runner. They read off the team names before the runners took off, and our name change to "What the Hill" didn't get in, so we heard "Insert Cool Name Here" come over the speaker. Luckily, there were other teams in our position, such as "Placeholder" and "We Need a Name"! After Bree took off, we headed to the first exchange point. The staggered start times meant that parking lots always had room for vans to park, which was great. I was glad I had a chance to see other people doing their exchanges before mine, so I could see how it all worked, but it was pretty straight-forward. When it was my turn to run, I started off too fast, and I was feeling so hot and tired after two miles that I actually had to walk the two short sections of shade I found. I'm not sure if I felt that way just because it had been so long since I'd done much running, or if it was actually the heat. Maybe both. Somehow I still squeaked by with a sub-9:00/mile pace and three kills (runners you pass who don't pass you back), but it certainly wasn't the best start for me. Everyone else did awesome on their legs. Erin had the hardest of all, with 8.2 miles of constant elevation gain. But she did it, even though it felt much warmer than the actual temperature of 75 degrees! It was kind of a blur driving between the exchanges, but lots of fun. We cheered for our teammates as we drove past them on the road, tried to stay hydrated, and ate a lot of cheese products. (We had two kinds of Cheezits, two kinds of Cheetos, Goldfish, string cheese, and Laughing Cow cheese. Perfection.) After Josh and Katy exchanged the baton (slap bracelet), we drove to Bellingham, which was the location of the first major exchange between the two vans. It's a good thing we had someone in our van who knew the other people, otherwise we would have been looking for them a lot longer! We only saw them for a few minutes before they took off toward the next exchange, but it was enough time to take a team picture (minus our seventh runner). After van 2 left, we wandered around Bellingham in search of food, ending up at a place called Local Public House. If only we weren't running and could have had beer! It was good to eat some actual food, though. Once we were done, we headed to exchange 12 in Burlington, where we would pick up with our second legs. We had a decently long break there, so some people slept, and the rest of us just hung out and got ready for our next runs. Erin ran after I finished, and we took so, so many sunset pictures at the exchange point while we waited for her at the next exchange. We parked alongside a garden filled with sunflowers, which made for a great foreground, and then the colors just got better and better. It got dark pretty quickly after that, which was perfect for when we got to exchange 15, with its disco lights and party music. A fun little mini rave, even though they kept playing the same Bruno Mars song. 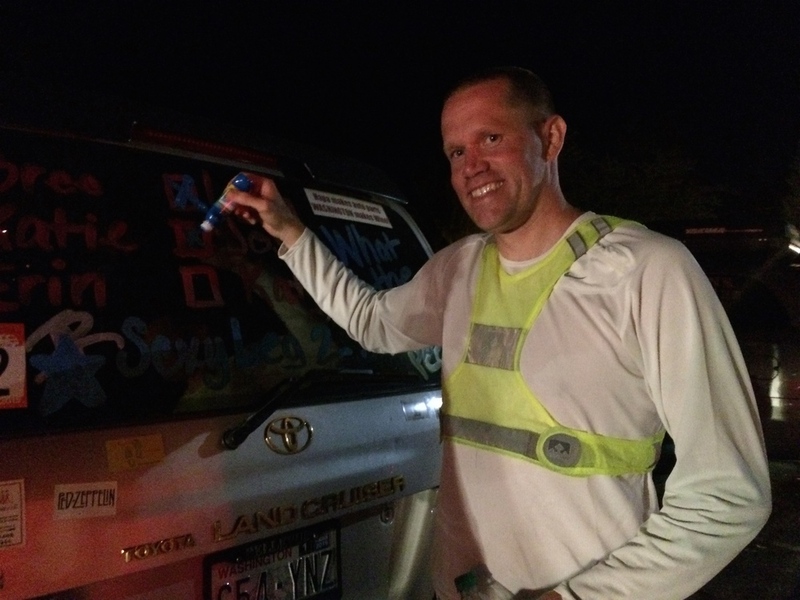 It was after midnight when we made the last exchange of the night with van 2 in La Conner. After we wrapped up, we headed to the next major exchange in Oak Harbor, so we could get some rest and not have to drive again in the morning. I was going to try to sleep in the school gym, but it was kind of loud and crowded, so I set up my sleeping pad outside near the van instead around 1:30 or 2am. I was worried I'd be cold, since I only had a really light fleece blanket, but it wasn't too bad, especially once I put on my thin down jacket. I'd probably do that again next time, but with a thicker blanket or a sleeping bag, since it got a little too chillier around 3:30am. Somehow I was mostly able to tune out the announcer calling team numbers all night, and I got up around 5am, since we were expecting van 2 close to 6am. Bree started things off again in the early morning, and I am so glad we started running our final legs when it was early but light out! Mine was short, but I kind of forgot that it was going to be a bit hilly. One such hill had 200 feet of elevation gain in 3/4 of a mile. I thought my time was decent, though, considering that (as well as the minimal amount of sleep). The rest of the morning was increasingly warmer, but everyone still did really well. 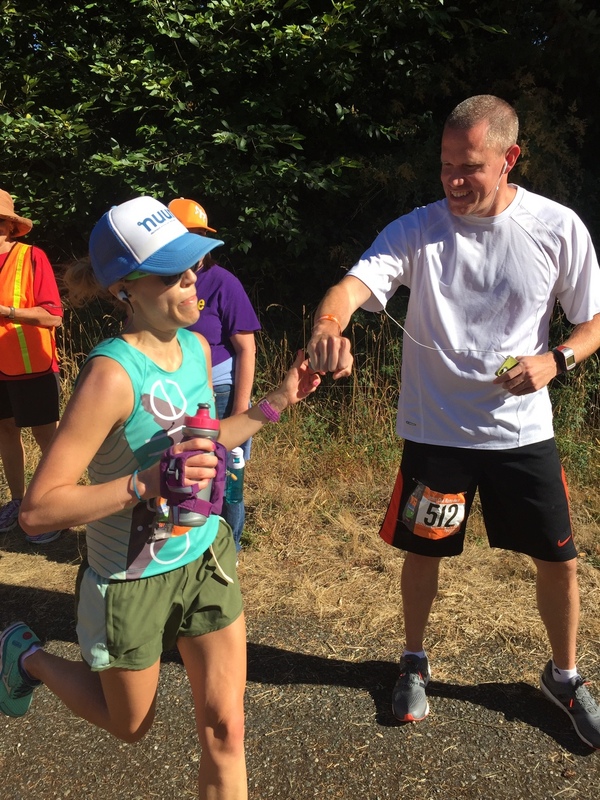 Lynn had her longest leg on this day, which also included two monster hills, so we stopped before each one to cheer her on and see if she wanted any water. (And, also, to take pictures, because one of those hills was right by a rocky beach.) 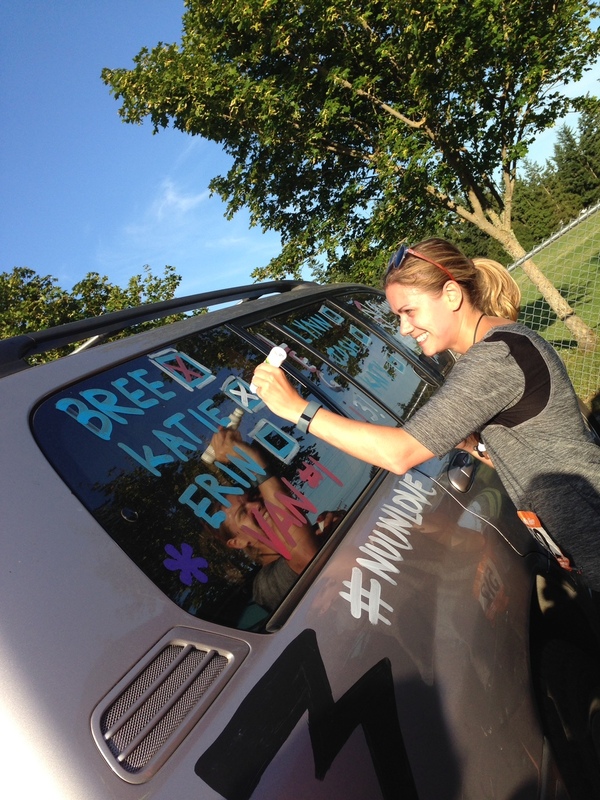 We had a bit of stress when we weren't able to get in touch with anyone from the second van when we were on our way to the last major exchange, but luckily we found them a few minutes before Katy arrived around 10:30am. Phew! After leaving that exchange, we headed to the finish line, where we were promised free beer and pizza. One problem: They don't give you any of that until your whole team finishes! That was about four hours away and we were hungry, so ended up buying our beers and food. Oh well. It felt extremely hot by this point, and there weren't a lot of places for runners to wait for their other teammates that weren't in direct sun, especially within the beer garden. We managed to hover long enough to snag a good spot in a barn, but we lost it when we decided to try to find the people from our second van. There was virtually no reception in the area, though, so that wasn't easy. Once we found them, we waited for our final runner, and then crossed the finish line with him as a team. We all look so refreshed, while he looks exhausted! We then received our medals, took a team photo, and finally got the long-overdue beer and pizza. 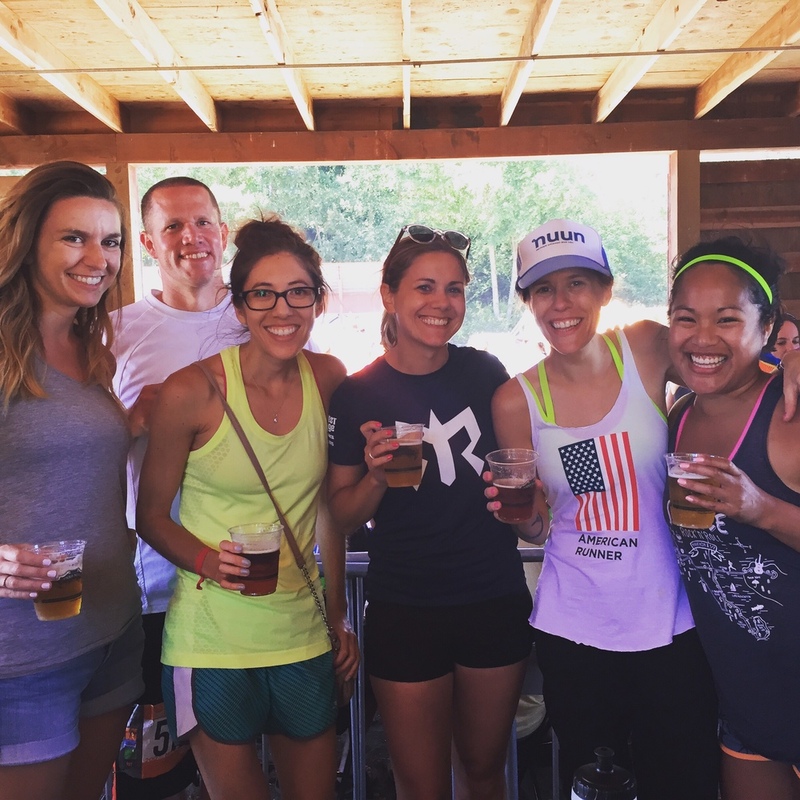 After we finished that second round of beers, we said goodbye to our van 2 teammates and headed to the ferry line to drive back to Seattle. 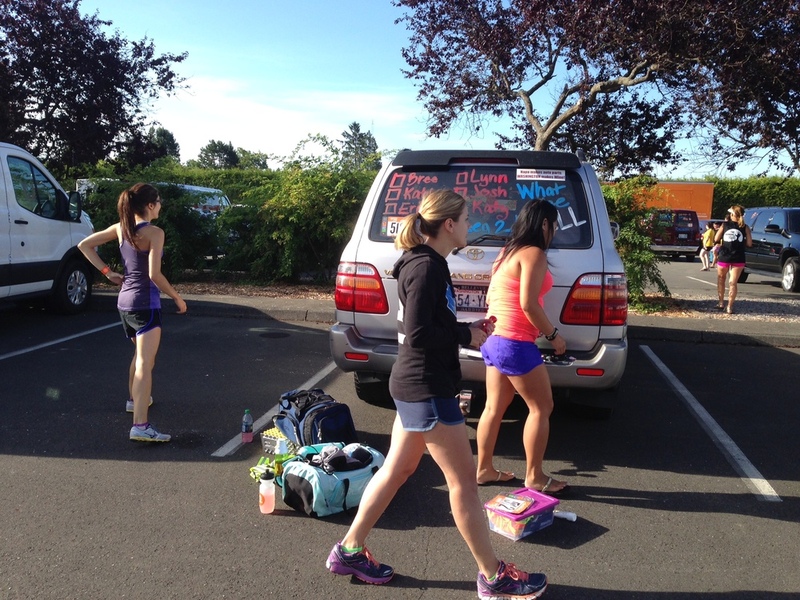 Now I'm going through some serious Ragnar withdrawals! The day after the relay, I had to take a couple weeks off from running because of a line-drive I took to the knee during our softball game. (And then became light-headed, passed out, got checked by some firemen, yada yada...) I'm getting back into it now, though! My knee still feels a little sore, but it's mostly fine, from what I can tell. I think I'll be in good shape for the two 10k races I have scheduled in August and September. Then hopefully we'll get our next Ragnar (or two!) on the calendar!